We are a leading Manufacturer of submersibles lb bush and bush parts from Rajkot, India. We have been engaged in the manufacture and supply of Bronze Bush Parts. The offered industrial bronze bush parts are substantially imperishable, owing to the hardness and toughness of the copper alloy. Our offered bronze bush parts are used in most of the industrial applications, requiring rotor movements. The offered bush parts are available at very cost effective market prices. We are one of the well known manufacturers and suppliers of Bush Parts. 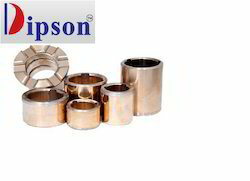 The offered bronze bush parts are widely used in the industrial sectors for the efficient thrust bearing applications. Our offered bronze bush parts have high tensile strength and high hardness. The offered bronze bush parts are ideal products for the rotor applications in electric motor, electric generator and alternators.